Police have been forced to defend a wanted man – after he was ridiculed online about his HAIRCUT. 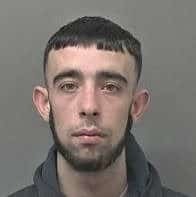 Humberside Police want to speak to Emilio Romana in connection with a burglary in Willerby, Kingston upon Hull on February 6. Mr Romana’s mugshot was uploaded to Twitter and Facebook and attracted at least 400 Facebook comments within hours – about his bowl cut high fringe. One urged police: ‘while you’re at it please arrest his barber’. Hundreds of users have since been mocking Mr Romana’s haircut – even commenting on his ears and calling him “Dumbo”. The post has received 649 comments and over 1,300 shares in just three days. The Twittersphere was also abuzz with jibes and taunts when the mugshot hit people’s news feeds. In light of the comments, police were forced to step in and urge people to be “respectful”. Humberside Police are still wanting to speak to Mr Romana and have asked anyone who knows of his whereabouts to contact them.